Philadelphia 76ers center Joel Embiid rebounds the ball past Indiana Pacers center Myles Turner during the second quarter at Wells Fargo Center. Tuesday night was roughly the biggest game for the Sixers franchise since they last made the playoffs in 2012, with a lot riding on their contest against the Pacers. Detroit's total collapse has made it nearly impossible for Philadelphia to fall out of the playoff picture, but seeding is still up for grabs. As things look right now, it looks like these teams could be on a collision course in another month. Indiana made further progress in their quest for a top-three seed, downing the Sixers 101-98 on their home floor. It was a game that swung wildly between ugly chaos and beautiful execution, and the cocktail favored an Indiana team that took care of the basketball. Unfortunately for the home squad, they, uh, didn't do that. The Sixers have had a lot of games this season where turnovers undid a lot of great work they were doing otherwise. Outside of the recent loss on the road to the Milwaukee Bucks, none of the other contests felt quite this bad. All told, the Sixers ended up with 21 turnovers when the final buzzer went off, and even that felt low after watching the game. The biggest culprits in the problem were Dario Saric, who had five of his own, and Joel Embiid, who gave the ball away eight times in one of the sloppiest games you'll ever see him play. Even when things went well for Embiid, he made things look more difficult than they needed to be. He scored on a dunk after posting up Trevor Booker with 13 seconds remaining, but he only got there after dropping the inbounds pass and having to scurry toward the sideline to collect the ball. The frustrating part is that the variety of cough ups meant there was no way to really pinpoint a fix. He was stripped by Al Jefferson of all people on a post-up, threw bad passes into traffic, picked up offensive fouls, and just looked like he couldn't figure out the speed of the game at times. Presented with an opportunity in transition to help his team edge closer in crunch time, Embiid just lost the ball, and half-heartedly looked around at the officials to help him out before slinking back down the court. I was looking forward to seeing what Embiid had to say after the game, and he's often his harshest critic when he has a rough night. But after apparently receiving no questions from a minuscule group of reporters while most of us were speaking with Brett Brown, Embiid decided he wasn't talking to the usual suspects on the beat when we made our rounds in the locker room. We're all left searching for answers as a result. His coach was more forthcoming about the problem, and he gave one of the great quips of the year before providing a more detailed answer. "It's hard to expedite people's birth certificate," said Brown. "If you go to who and where, we have to get better with some individuals. I think as a team we have to get better, some of it I have to own. I think when you look at the trending that has been going on after the All-Star break, we are improving. But tonight wasn't one of those nights." The turnovers from Saric weren't a lot more palatable, and in some cases were worse than Embiid's. On several different occasions, the Sixers got stops and got out on the fast break going the other way. In theory, this is where they thrive. But with the ball in Saric's hands, he threw some horrendous passes that never had a chance to reach their target. If not for Embiid and Saric, this Sixers team would be nowhere near a playoff berth, so you do have to live with growing pains to a degree with guys who are at their talent level. Eventually, they will learn to walk the line between risk-taking and smart offense, and this problem will fade into the background. For now, it remains a fatal flaw of the team's makeup. If the Sixers bow out unceremoniously in a playoff series, no one will be surprised if it's because of ball security. Where is the awareness from veterans in crunch time? There are fewer excuses for how some of the team's veteran players have performed when the stakes are highest. I'll say it until I'm blue in the face: living through mental errors is doable when you're watching young players grow, and much less so when it's the veteran help brain cramping. Tuesday's example came through JJ Redick. Down three and with the ball in their hands, the Sixers got out and ran with their eyes on tying the game up. That's all well and good. What's not acceptable is Redick taking the opportunity and heaving up the longest two possible, losing sight of the three-point line in his quest to get up the jumper. There's nothing wrong with taking a shot if it's there in this situation, particularly if it's available to the guy who you want to let it fly from three. Going for a quick two and playing the foul game with Indiana also wouldn't have been the worst idea in the world, as it would have left Philly plenty of time to get another look at the basket. But losing sight of the three-point line and forcing up the worst value shot in basketball is inexcusable here, particularly when you have as much time to generate offense as the Sixers did here. Their halfcourt struggles notwithstanding, some in-game intelligence would be appreciated in this sort of moment. That's what you're supposed to be buying when you sign Redick to a monstrous one-year contract. Makes and misses come and go, but a baseline of awareness should remain. It didn't on this night, and Redick has made quite a few silly plays when things have been tight throughout this season. With his seventh triple-double of an excellent rookie campaign, Simmons drew level with Magic Johnson for the second-most all-time for a rookie player. Great company to keep, and if he can have even half the career of Magic, Sixers fans are in for a great future. This one just felt particularly hollow for Simmons, who wasn't particularly effective attacking the basket and whose flaws contributed to the team's unraveling. I am not in the camp of people who believes Simmons is afraid to go to the free-throw line, but he certainly isn't willing as he needs to be to force defenses to foul him. He is big and athletic enough when he gets a head of steam going to get to the line almost at will, but he doesn't always play to his size. Rather than going strong toward the rim, Simmons can get caught drifting and floating away in search of a pass, not a shot. On one hand, his willingness to look for teammates more often than his own shot is admirable, and it's why he was anointed the point guard by his coach. But there's a time and place for that, and Simmons needs to recognize more often where he's at within the hierarchy of the team. No one is going to fault him for looking to strike at the heart of a defense, make or miss, and he has to be more willing to invite contact if he's going to take the next step on offense. This is an element of his game that might be as important or more important than his progress as a shooter. If the jumper never comes, he'll be even more reliant on generating his offense in the paint than people believe he'll be right now. In that timeline, earning zero free-throw attempts in a game simply won't be good enough. When I wrote about the arrival of Belinelli last month, I warned fans that he would at times be just as frustrating to watch as any of the bench players fans yelled about early in the season. He lit it up in his debut and silenced that talk for a minute, but you can see exactly why Belinelli was available as a buyout candidate when you watch him play. If his shot isn't falling, things can get pretty gruesome, particularly on the defensive end. Indiana absolutely tortured him on defense during his 26 minutes played Tuesday, delighting at the prospect of having him switched on one of their perimeter guys. Victor Oladipo was in the midst of a dreadful game by his 2017-18 standards — he shot 4/21 on the evening thanks to a lot of great defense from Robert Covington — and that didn't stop the Pacers from trying to force switches on his man every time they got a chance. It doesn't take a rocket scientist to figure out why. Belinelli is not equipped to guard most perimeter players in isolation, and it took some heroic work on the back end to minimize the issue. Lance Stephenson left him reaching at air midway through the fourth quarter, and the only thing that prevented a layup was elite charge taker Ersan Ilyasova. The problem is not necessarily a lack of effort, rather a combination of poor instincts and tools. You can see it pop up all over the place. Indiana isn't shy about getting out in transition, and defenders have to be on the same page in that setting or you end up making late closeouts that have little impact on shot attempts. Belinelli does well enough to cut off a pass to Thaddeus Young streaking toward the rim, but Simmons is in position to deal with that threat. The help from Belinelli leaves Corey Joseph free on the wing, and he makes Philadelphia pay. This stuff is a lot less tolerable when Belinelli isn't offering anything on offense. He has shown some buy-in, which is half the battle, but playoff teams will absolutely feast on this when it comes down to it. What is Philadelphia's plan for the backup five spot in the playoffs? During some solid first-half minutes, I tweeted out that I thought Amir Johnson was having himself a nice night even if the rest of his team wasn't to that point. He altered shots at the rim, forced a turnover near the perimeter that sprung a fast break, and did a pretty good job of keeping Myles Turner in front of him during a strong performance from the Pacers big man. Whoops. It went off the rails from there and following some poor minutes in the third quarter Johnson was parked on the bench all the way through the final whistle. Brown even brought Embiid in a little earlier than usual in the third frame, dissatisfied with Johnson losing the plot. Since Ilyasova's arrival, Brown has experimented with turning to Ilyasova at the five and did so again on Tuesday night. It didn't work out too well this time, with the Sixers losing ground during the three minutes or so he spent there in the fourth quarter. In fact, almost immediately after Ilyasova took over center duties, Turner unleashed an uncontested dunk on the Sixers' end of the court off an inbounds play. The question facing Brown heading into the final stretch of the year is how he chooses to sort out the rotation behind Embiid. It doesn't look like he's going to stray from the plan to go with Johnson for most of the backup center minutes, but lineups with Johnson in them have been trending in the wrong direction since the start of February. Offensive improvement with Johnson on the floor (105.1 PTS/100 possessions) has been offset by defensive regression (105 PTS allowed/100). 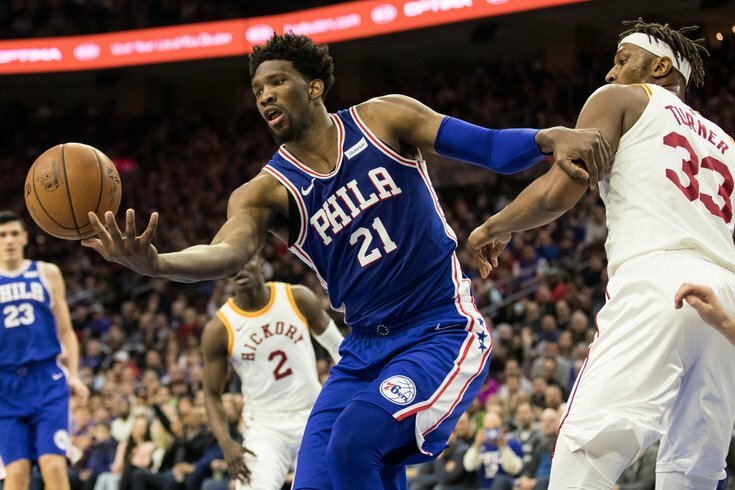 The former number can be credited to the improvement of Simmons without Embiid on the floor, which has been a major plus for the team since the calendar turned to 2018. But Johnson is in there for defense, and units with Johnson in them have been sliding as of late. How the backup center problem is answered is a long-term problem for Philadelphia, but it's important this season for sure. Ilyasova is a good monkey wrench, change-of-pace option, but I don't think his defense is good enough as a five to win those minutes consistently. Richaun Holmes is the answer many fans point to, but he has consistently and repeatedly failed to hold up his end of the bargain on defense as a center. Do you tinker with the rotation this late in the game, hoping Holmes can make an unexpected step forward as a pick-and-roll defender? Do you hope the Johnson minutes of late are an aberration? Do you lean more into Ilyasova at the five, hoping his ability to space the floor for Simmons increases offensive productivity enough to bail out your defense? I'm not sure what the right answer is. But it's on Brown has to figure out in the weeks to come, lest the Embiid-less minutes kill his team when the games really matter.